Stem cells are at the forefront of medical research and incite some of the most controversial ethical and religious debates worldwide. While regarded by many top scientists as the Holy Grail of medicine, others consider embryonic stem-cell research sacrilegious. Recent advances in the field of stem-cell research are giving hope to millions. Are stem cells to become the future silver bullet of medical practice? Avant-garde approaches to stem-cell therapy may be the first stepping-stones to a bright new future of stem-cell medicine and are emerging in leading laboratories worldwide. A number of large biotech companies and scientists are looking toward stem cells as the basis for a therapeutic solution to cure such illnesses as blindness, diabetes and spinal cord injuries. In the future, embryonic stem cells may be able to restore sight to millions of people. The term stem cell can be defined by two very important qualities: the cell has the ability to self-renew and, in a more general sense, the cell has not completed differentiation into its final state. This general definition includes a wide variety of cells with varying degrees of differentiation potential. At the top of the list comes the zygote—a fertilized egg, which of course has the ability to divide and differentiate into all cell types in the body and create a new organism. Such a cell is considered omnipotent or totipotent; in other words, it has the potential to become any type of cell. The first three divisions of the zygote give birth to eight totipotent cells, each of which also has the ability to become an entire organism. As the embryonic cells divide and the daughter cells differentiate, they become increasingly specific. The early mammalian embryo consists of the extra-embryonic cell layers—the trophoblast and a body of cells called the inner cell mass (ICM), which eventually become the embryo proper. The cells of the ICM are no longer omnipotent, because they no longer share the fate of the trophoblast, and they have committed themselves to an embryonic fate with the ability to become any cell in the body (but not the trophoblast). These cells are considered pluripotent. 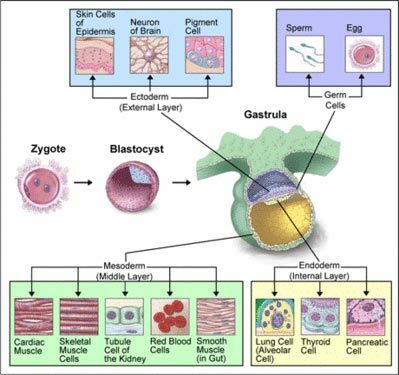 The ICM continues to differentiate into three germ layers—ectoderm, mesoderm and endoderm, each of which follows a specific developmental destiny that takes them along an ever-specifying path at which end the daughter cells will make up the different organs of the human body. Cells from the ICM are called embryonic stem cells; however, there are also stem cells in the adult body. These adult stem cells are considered multipotent, having the ability to differentiate into different cell types, albeit with a more limited repertoire than embryonic stem cells. They are found mainly in renewing tissues, such as the skin, the inner lining of the gastrointestinal tract and blood tissues. In addition to their ability to supply cells at the turnover rate of their respective tissues, they can be stimulated to repair injured tissue caused by liver damage, skin abrasions and blood loss. The ability of our body to regenerate some of its tissues is largely owed to the reserves of adult stem cells. However, not all tissues possess the ability to regenerate. Injuries to most parts of the nervous system, for instance, are considered nearly impossible to heal naturally, if at all. Adult stem cells can be used to accelerate bone or tendon healing, and they can induce cartilage progenitor cells to produce a better matrix and repair cartilage damage. In rodents, and even in some preliminary trials in humans, human embryonic stem cells have been shown to bridge gaps in spinal cord injuries, allowing restoration of motor functions. Adult stem cells can be used to replace damaged heart-muscle cells and are used in practice today. The most common application of adult stem cells is probably the restoration of blood cells for patients with leukemia, and there are many more applications currently in practice. The rest of this article will deal with embryonic stem (ES) cells and the future they hold for modern medicine. On May 27, 1995, the world was shocked when actor Christopher Reeve, best known as “Superman,” became paralyzed from the neck down after falling from a horse. The damage to his spinal cord was so severe, it left him crippled until the end of his life. Christopher Reeve and his wife, Dana, started a foundation that continues to encourage research in the field of spinal injuries, the Christopher Reeve Foundation. A particular field encouraged by the foundation is stem-cell research, with the great hope that it will result in the ability to get cells to differentiate into neurons and support cells to bridge the gap of a spinal cord injury. Stem cells from a variety of sources have been effective in improving motor function after spinal cord injury in animals, making it an extremely promising field. It has been the hope of many that embryonic stem cells will be able to differentiate into neural cells and take the place of the damaged cells. So far, there has been limited success in achieving this goal in humans. Predifferentiated ES cells injected into mice with spinal cord injuries have been able to restore some of the sensory functions and prevent chronic pain behavior. However, this field has progressed further using adult stem cells rather than ES cells. Diabetes affects hundreds of millions of people worldwide. In Western countries, it has risen to pandemic proportions. 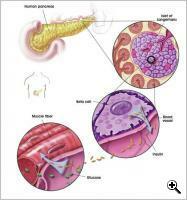 The most common type of diabetes (type I) occurs usually in children or young adults and results when beta cells in the pancreas are destroyed for some reason. 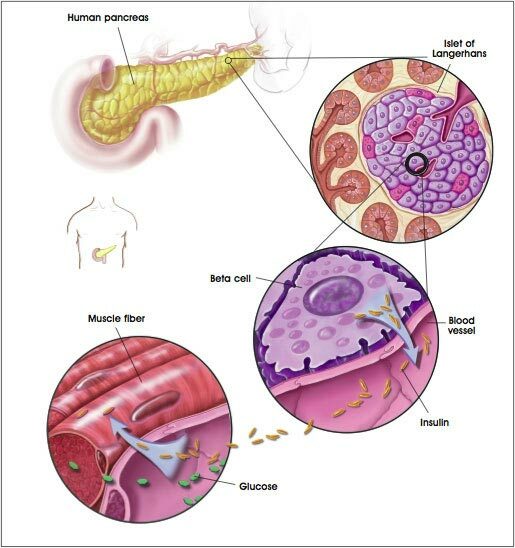 Beta cells are in charge of releasing insulin into the bloodstream when glucose levels are high, such as after a meal, to instruct the cells of the body to take up glucose. When these cells are destroyed, insulin is not released and the patient must take insulin artificially. 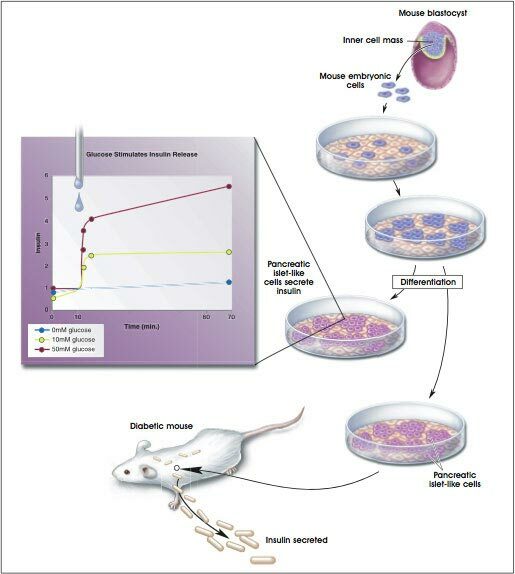 In mice with diabetes, adult stem cells from the bone marrow have been shown to be able to navigate to the pancreas and effectively restore function of damaged pancreatic cells that were damaged; and in humans, a risky trial of 15 patients was undertaken, in which hematopoietic stem cells were removed, treated in the laboratory and infused into patients. Fourteen of the 15 participants were cured (remained insulin free) for periods between 1 and 35 months. However, use of adult stem cells has its limits, they are very difficult to grow in culture, and obtaining sufficient amounts could prove difficult. By contrast, ES cells can be maintained indefinitely in culture and do not provoke a strong immune response when transplanted. 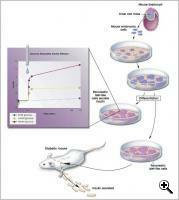 In mice, embryonic stem cells can be differentiated in the lab to become beta cells and cure mice with diabetes. Several laboratories claim they have succeeded in turning Human Embryonic Stem (hES) cells into insulin-producing cells, raising the hopes that in the future, hES cells may be used to cure diabetes simply by giving back to patients the cells that were destroyed. 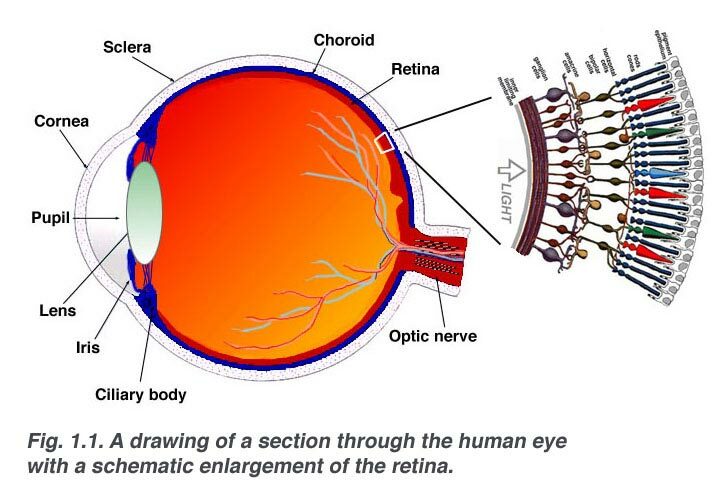 The retina of the eye is the interface between the mechanical part of vision and the brain. The ability to pick up a light signal is bestowed upon us mainly by two special types of cells in the retina—cone and rod cells, generally termed photoreceptors. These cells obtain the ability to convert a photon into a cellular message that is conveyed to the brain through an electrical impulse. The photoreceptors are supported by a single layer of important cells that lie on the outermost layer of the retina, at the back of the eye: the retinal pigmented epithelium (RPE). The RPE both nourishes the photoreceptors and recycles the proteins needed for vision. Without the RPE, photoreceptors die and patients become blind. RPE dysfunction is the most common cause of blindness in people over 60 in the United States, and it affects over 30 million people worldwide. While there are many pathologies of the eye that can be rectified mechanically or surgically, dead retinal cells cannot be replaced in this manner, leaving millions of people with a supposedly incurable form of blindness. However, new hope is emerging from the field of stem-cell therapy. Dr. Robert Lanza, vice-president of research and scientific development at Advanced Cell Technology, Inc., and his coworkers have been successful in culturing stem cells in petri dishes, making them differentiate into RPE cells, isolating them, and being able to passage them in vitro to generate sufficient numbers to replace the damaged retinal cells of rodents with macular degeneration. This model consists of rats with a genetic disorder where they do not have one of the enzymes needed for the RPE cell layer to function. As a result, the rats become blind due to deterioration of their photoreceptors. 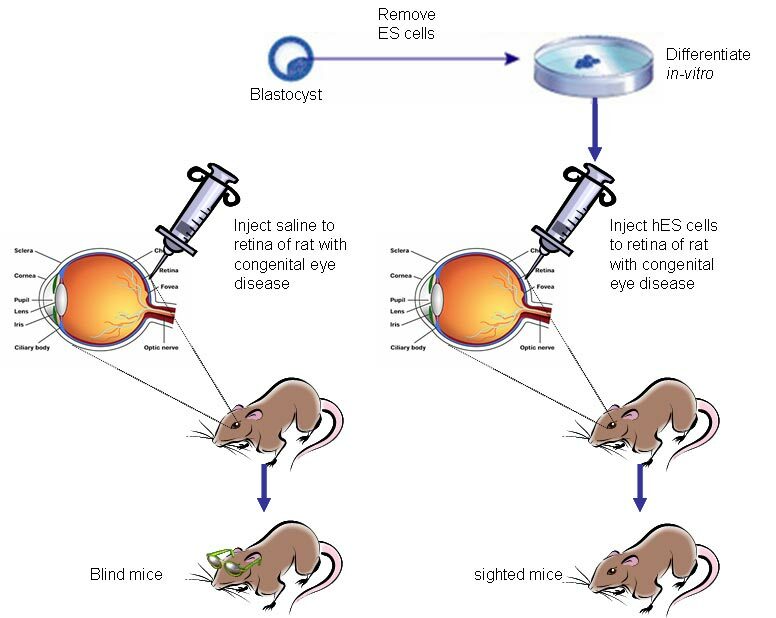 Following transplantation of human ES cells, injected into the sub-retinal area of the eye, rats displayed recovery of their photoreceptors and improved visual ability compared to the control rats, which were injected with a mock treatment and showed no significant improvement. 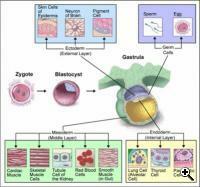 How are stem-cell lines established? 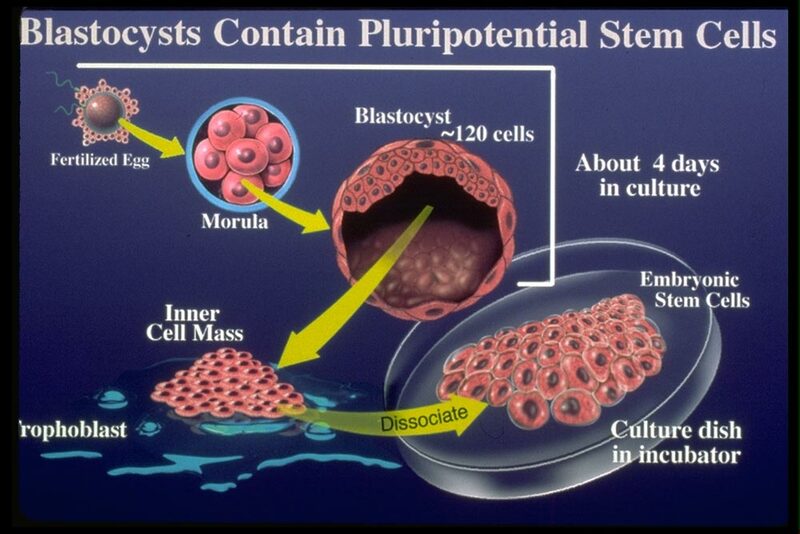 As mentioned above, ES cells are obtained from the ICM of the blastocyst stage (before implantation of the embryo). At this stage the embryo consists of a mere few hundred cells and cannot even be seen by the naked eye. 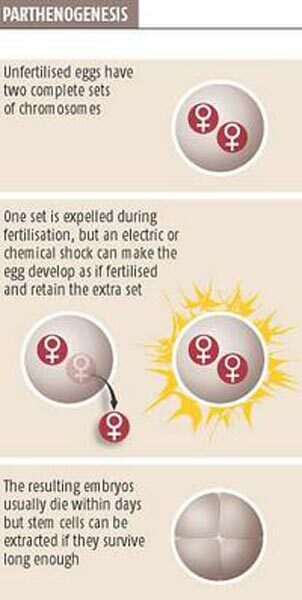 A major source of fertilized eggs is fertilization clinics. When patients have completed their treatment, they may leave behind up to several dozen embryos that were not used for conception. These fertilized eggs can be frozen for future use, or if the couple has no intention of using them, they are either discarded or donated for research. It is from these blastocysts that ES cells can be removed, plated and grown indefinitely in culture. These ES cells have the genetic makeup of the parents, and are therefore limited in clinical use for transplantation because a patient’s immune system would most likely reject them, perceiving them as foreign objects. 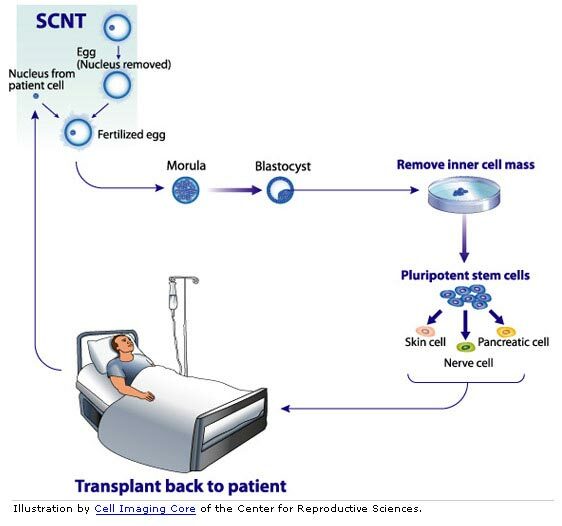 Therapeutic cloning: Human embryonic stem (hES) cell lines can also be “custom made” for the patient by a revolutionary process called “somatic cell nuclear transfer” (SCNT) or “therapeutic cloning.” In this process the nucleus of an ordinary differentiated cell from the patient is transferred using microscopic tools into a human oocyte (egg) instead of the oocyte’s original nucleus. There seems to be something in the egg’s cytoplasm that can reverse the differentiated status of the patient’s nucleus, and the cell will continue to divide to generate a blastocyst with ES cells with the exact genetic makeup of the patient. ES cells can be removed from the ICM and a cell line can be generated to match the patient’s genotype. These cells will not be rejected because they are exactly the same as the patient’s. The major drawback of this method is that it is still very inefficient, and many oocytes are needed to create just one cell line. This makes SCNT an extremely costly and complicated procedure and not likely to be a major method for producing therapeutic hES cells. There are those who would argue that there is also an ethical problem with this method. SCNT is the procedure that has been used for cloning animals such as Dolly, the sheep who was the first mammal to be cloned. The blastocyst has the potential to develop into a fully grown organism, identical to the original donor. Reproductive cloning of humans is, of course, strictly forbidden, but concerns have been raised that should it become publicly accepted, it is only a matter of time before a renegade scientist follows the SCNT through to a cloned human baby. Parthenogenesis: This is the Greek term for reproduction from an unfertilized (usually female) gamete (egg), meaning the embryo produced is uniparental. This is a form of reproduction in some plants and lower invertebrates. In our context, it means the development of a blastocyst without the use of a sperm cell. An oocyte is derived before the second meiosis, meaning that it contains two nuclei that are almost genetically identical. In a normal zygote, half of the genes are from the oocyte (the mother) and the other half come from the sperm cell (the father). Each parent contributes their genetic makeup, doubling the complexity of the genes. In a parthenogenetic pseudo-zygote, which is made up only of the maternal genes, the complexity of the genes is only half. For most genes, this is unimportant, but for the genes that make up the proteins that contribute to tissue compatibility (the HLA complex) it makes an enormous difference. It’s a bit like a combination lock: with six numeric options you have nearly one million possible combinations, but with half the complexity—three numeric options—you have only 999 combinations. So ES cells derived from parthenogenetic blastocysts could be more readily introduced into patients without the trouble of immune rejection. Dr. Lanza and his team have developed a method to produce ES cells from just one cell of the early embryo. Up to the eight-cell stage of the mammalian embryo, a cell can be removed without disturbing the normal development of the embryo. 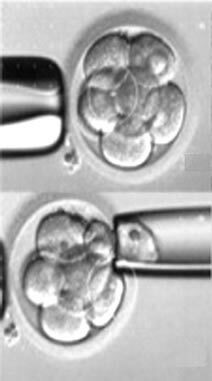 Blastomere (the omnipotent cell of the very early embryo) removal from the eight-cell stage is commonly used in fertility clinics for checking the embryos for potential genetic problems. The procedure is called preimplantation genetic diagnosis (PGD). A single cell is removed at the eight-cell stage, grown in culture and inspected for genetic makeup. In parents with potentially serious genetic diseases, only healthy embryos would be selected for implantation. Dr. Lanza and his team have shown that ES cells can be derived from this single cell. The great advantage of this method is that it circumvents any ethical issues regarding the destruction of a potential human life, because the embryo continues to develop normally. The ES cells can be kept frozen as a stock of “spare parts” for the person from whom they were derived or they can be used in hES cell research. The controversy over ES cells is, in essence, a religious and ethical debate. The definition of what is considered a human being differs between culture and religions. The most conservative view is the Christian Catholic belief that an embryo is considered a human being from the moment of fertilization of the egg, therefore destruction of a fertilized egg is essentially murder. Protestants have a more pluralistic view—and there are many others, such as that embryos gain personhood gradually, and therefore early embryos may not be considered human. Should the more conservative view be adopted, research of hES cells would essentially constitute the termination of potential human lives. According to Judaism, pregnancy is divided into six stages, during each of which the fetus’s rights as a human being change, and it is only considered a full human being when it is born. This does not mean that the embryo does not have rights. According to Jewish law, embryonic cells outside of the uterus are not considered to have any legal rights because they are not part of a human being. The embryo gains status as a fetus only after the first 40 days. Blastocysts are considered the same as sperm or eggs, but they cannot be “wasted” unless it is for the sake of saving human lives. Islamic law permits the use of early embryos for medical purposes as long as it is before the embryo “gets its soul,” which is around day 40 of pregnancy. More information on hES ethical and religious issues can be found here. Countries that completely ban any type of ES cell research: Austria, Brazil, Ireland, Norway and Poland, among others. Countries that allow research from old ES cell lines but do not permit the establishment of new cell lines (using public funding): Germany and the United States. Countries that allow ES cell research for medical purposes and the establishment of cell lines only from embryos that were conceived during fertility treatments and are no longer needed: Australia, Canada, Finland, Israel, Japan, Singapore and Sweden. Countries that allow research on ES cells that were derived from fertility clinics or for research purposes, meaning that ES cells can be created from blastocysts that were created specifically for research purposes: United Kingdom and United States (using private funding). This is not just semantics. The Bush administration is blocking Federal funding for researchers who deal with stem cells, impeding stem-cell research from proceeding at the expected pace. President Bush has systematically vetoed bills that would fund stem-cell research. Currently the only hES cell lines that can be used with Federal funding are those that were established before August 9, 2001. Researchers say that these lines are of poor quality and have limited practical potential. The presidential veto has caused much aggravation and frustration in the scientific community and has borne the brunt of many criticizing editorials. There is also the problem of intellectual property and legal rights over stem-cell lines. Producing and cultivating lines of hES cells is a complicated and expensive procedure. Some people argue that because stem-cell research in the U.S. is currently funded from mainly private money, ownership of the cell lines and any future benefits stemming from them should remain legal. 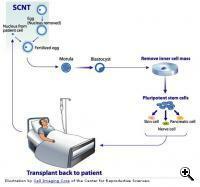 Protocols for stem-cell cultivation are being developed and are being patented. The critics argue that stem-cell research should be available to the benefit of all, that success in cultivating a cell line could have been achieved anywhere with adequate funding. Researchers are claiming that protocols for cultivating hES cells are obvious, as they are the outcome of using already-known technology, and therefore unpatentable. To acquire more insight into the potential of hES cell technology, TFOT recently interviewed Dr. Robert Lanza, vice-president of research and scientific development at Advanced Cell Technology. 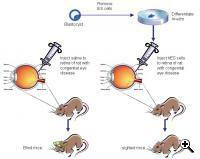 Q: Of the many possible applications of human stem-cell therapy, why did you choose to focus on RPE cell replacement? A: We believe these cells could be used to treat blindness and degenerative eye diseases, such as macular degeneration and retinitis pigmentosa. We choose this application for several reasons. First, the eye is an immune privileged site—which means transplanted cells won’t be rejected as aggressively as the rest of the body. Second, many of these diseases are quite serious. For instance, macular degeneration alone affects more than 30 million people worldwide and is the leading cause of blindness in patients over 55 in the United States. And finally, it turns out that except for neurons, very few replacement cell types can be reliably generated from human embryonic stem cells. For clinical therapies, you need to be able to generate them in sufficient number and purity for them to be of therapeutic value. The RPE cells we generated have been extensively characterized and have all the markers and behavior of normal retinal cells. We have demonstrated that these cells can rescue visual function in animals that otherwise would have gone blind. There was a 100% improvement in visual acuity over untreated controls without any apparent adverse effects. Q: In the rat model, you injected the cells into the retina at post-natal day 21, before photoreceptor deterioration had occurred. Patients that are to be treated will already have lost many of their photoreceptors. Have you observed photoreceptor cell recovery following RPE cell transfusion? A: Of course, the goal of the therapy is to attenuate visual loss—that is, to maintain vision in patients who—if untreated—would continue to lose the rest of their photoreceptors and eventually go blind. Our tests clearly show that RPE cell transfusions were capable of extensive rescue of photoreceptors. That is, the cones and rods we see with were preserved by transplantation of the cells. To give you an idea of just how impressive the results were, in untreated animals, the layer of cells the animals see with was only one layer deep after 100 days. However, in the treated animals, the cells were a healthy five to seven cells deep. We also have work underway using earlier progenitors that have the ability to generate the photoreceptors themselves, as well as most of the other components that may allow us someday to actually reverse blindness after it has already occurred. Stay tuned. Q: What advantages do you see in using stem-cell therapy over standard RPE cell transplantation? A: There are numerous advantages of using cells derived from embryonic stem cells as a source of RPE for clinical studies. Primary RPE tissue (usually from fetuses) cannot be obtained in large enough quantities for wide-scale clinical use. Furthermore, practical restrictions prevent full safety testing from being performed on every fetal or adult donor source, nor can the functional parameters of graft efficacy be systematically assessed. In contrast, unlimited quantities of embryonic-stem-cell-derived RPE can be derived and maintained under well-defined and reproducible conditions using traceable reagents, including specific lots of media, sera, growth factors, and other culture materials. New and additional banks of RPE can be created to test and further optimize yields and functionality. Q: How do you propose to overcome the problem of tissue immunocompatibility? A: It has been found that despite the immunoprivileged status of the eye, RPE cells can still be rejected, albeit less floridly than a typical tissue mismatch. With the further development of somatic cell nuclear transfer (therapeutic cloning), parthenogenesis (just recently reported), or the creation of banks of reduced-complexity human leukocyte antigen (HLA) embryonic stem cells, RPE lines could be generated to overcome the problem of immune rejection and the need for immunoprotective regimens. In the meantime, local immunosuppression (in just the eye) could be administered if it proves necessary. Q: Where do we stand in terms of clinical trials in human patients? A: We’re hoping to file an IND (Investigational New Drug) application with the Food and Drug Administration (FDA) for human clinical trials in patients by early next year. Q: Sustaining hES cells indefinitely in culture for future differentiation and clinical use raises concerns about the genetic integrity of these cells after long-term passaging in vitro. How can you reassure people that the differentiated cells will be safe to use and will not develop into tumors? A: First of all, there is never any need to passage hES cells long-term. We freeze down large banks of early passage hES cells that can periodically be thawed to start the process anew, which can also be expanded and frozen down early on. Importantly, once you have RPE cell lines, they undergo dedifferentiation and expansion—over 30 population doublings—just like the primary RPE tissue in the eye. As far as safety, in compliance with FDA standards, we are of course carrying out very extensive—and long-term—safety and dosage studies in animals to ensure the cells won’t cause tumors or any other unwanted pathology. A range of scientists, clinicians, safety experts and, of course, the FDA, will carefully scrutinize these results. Q: What are the advantages of using embryonic stem cells over adult stem cells? A: Embryonic stem cells are the body’s master cells—they are undifferentiated and immortal—and can become virtually every type of cell in the body. In contrast, adult stem cells don’t have as much versatility—they can only become this or that specific cell type. Thus, most scientists think that embryonic stem cells have the potential to treat a much broader range of human diseases. For instance, we’re unaware of any usable adult stem-cell source for generating the RPE cells. Q: The political setbacks of stem-cell research are well known, but what, in your view, are the major scientific setbacks or difficulties in this field? A: Aside from politics, the lack of funding is the major problem. Without money there’s no research—it’s as simple as that. Of course many private groups such as the JDF and Christopher Reeve Foundation have stepped forward with millions of dollars in grants—and they are to be applauded for this. However, even a generous private sector will be hard pressed to fill the government’s role. Overcoming the remaining scientific challenges will require a large and sustained investment in this research. The Federal government—and individual states—are the only realistic sources for such an infusion of funds, and remain the greatest hope for moving ES cell research in this country (U.S.) into the clinic in the next five to ten years. Q: There are several methods to generate an embryonic stem-cell line: blastocyst donations from fertility clinics, therapeutic cloning (SCNT), parthenogenesis or even a method you have recently published a paper on—blastomere removal at the eight-cell stage. Which of these methods do you envision to be the most practical for widespread use in the future? A: Embryonic stem-cell lines generated from either blastocysts, which destroy the embryo, or from single-cell biopsy, which doesn’t harm the embryo, are the most immediate and practical methods for wide-scale use in the future. Theoretically, parthenogenesis and therapeutic cloning (SCNT) could be used to provide an exact match for a small number of egg donors. But this would be of little value to the public health at large. It’s hard to even obtain a handful of human eggs for research, let alone the millions of eggs that would be necessary to match all the patients who could potentially benefit from this technology. On the other hand, it might be possible to use these two technologies to produce a stem-cell bank with reduced HLA complexity. For instance, a small bank of approximately a hundred parthenogenetic or SCNT lines could theoretically furnish a complete haplotype match (of all the major MHC types) for half (50%) of the U.S. population. Without parthenogenesis or cloning, it could take tens of thousands of stem-cell lines to achieve this same goal—clearly it’s an impractical task. Q: There has been recent criticism of universities such as the University of Wisconsin for patenting hES and primate cell lines. What is your stand on this matter? A: I have very mixed feelings about this. Certainly I’m against anything that interferes with moving this technology into the clinic and helping people. In that regard, these patents have slowed progress in the field. But in the larger picture, it’s going to require hundreds of millions of dollars to get stem-cell therapies into the clinic. Without patents, biotechnology and pharmaceutical companies will not invest the money needed to make it happen. As far as the University of Wisconsin, like many other scientists, I wonder whether these patents should have ever been allowed to begin with. Embryonic stem cells were around long before the “WiCell” patents were filed. Q: What is your vision for the future of stem-cell therapy over the next 10 years? A: Of course, there are still many scientific challenges that need to be overcome, but in the next ten years, I think we’ll be well into the next great medical revolution. Hopefully, we’ll be in human clinical trials for a range of human diseases, such as blindness, spinal cord injuries and cardiovascular disease. I also think we’ll be able to reconstitute stem-cell derivatives into more complex tissues and structures, such as bone, blood vessels and even whole organs. We may not be able to grow an entire heart or kidney by then, but the basic science should be well underway.